Welcome to Mother’s Day Month! My Mom lives in Brazil and every Mother’s Day I send her a nice gift in the mail followed by a phone call and a long conversation. And yes, tears are just part of the ritual. I guess what I am trying to do is somehow narrow the void created by the distance of living here in Boston. However this year I did something very original…. I surprised her with myself! Let me explain. Without her knowing it, I flew to my homeland, had my best friend pick me up at the airport and bought a large flower arrangement on the way to my Mom’s. As previously arranged with my friend Fabiano, he called my Mom the day before and mentioned that he was going to visit a client near her and wanted to stop by to pay her a visit. She lives in an apartment complex and it was easy for me to ‘sneak in’ the building without her knowing it. Fabiano knocked on her door and entered the apartment. Everyone was chatting while I was hiding in the hallway. After a couple of minutes I knocked on the door and Mom opened the door slowly, a little suspicious, as she was not expecting anyone else…..and then BOO! What a surprise for both of us and lots of tears for sure. 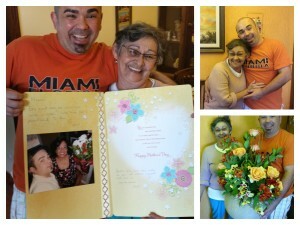 This was a Mother’s Day that will be remembered for many years to come! But don’t let this simple tale fool you. Before getting to the hugs and crying part of the story, lots of planning and coordination were required between scheduling my workload, flights and even my friend’s schedule. A: Having good window quality shades is very nice just like receiving a gift in the mail. But once you experience the many features and convenience that only automated shades and blinds can provide, you will feel like there is a real person in the house doing the work for you. B: Buying motorized shades does require a bit more planning – just like traveling abroad. We need to choose the best way to power your new blinds and shades. It can be battery operated or hard wired (usually done pre-construction in a home). Also, we need to decide on the control options: by handheld remote or the ability to use mobile devices such as your phone and tablets. To learn more, please visit my recently created Motorization page with lots of information. As always, feel free to give me a call at 508.520.6700 or email me to ask questions. You can ask for a tissue or two as I have some left in my luggage.